Learn More & Get FREE Stuff! “He Takes Up Our Sins” - An amazingly memorable science experience that illustrates the power of absorption, transpiration and beautifully illustrates the scriptural passage in 2nd Corinthians 5:21. This powerful illustration will stick in the hearts and minds of kids for a lifetime! “The Hidden Message” - A sweet science twist allows for a secret and hidden message that illustrates God's perfect timing to reveal His plan for salvation. God kept the plan for saving the world hidden for thousands of years, only revealing hints. But at just the right time, He revealed His master plan! “Span the Gap!”Work hard! Work as teams! Construct a sweet truss bridge that spans three feet. Use common, household items to make a not-so-common-structure! The "Step-by-Step" tutorial video makes this science project a breeze. This is NOT your typical lame craft...It is a real science project! “The Almighty Can Crusher” - Bring awe and surprise with this simple science illustration using household materials. No one will see this illustration coming as you easily amaze both kids and volunteers. Do it over and over for maximum impact. Kids will consider the invisible and almighty hand of God with this unforgettable illustration. “Powerfully Invisible” - A hilarious science illustration that will have kids squealing with delight and amazement! This illustration allows for active learners and will have all kids yelling, "Do it to me...Do it to me!" 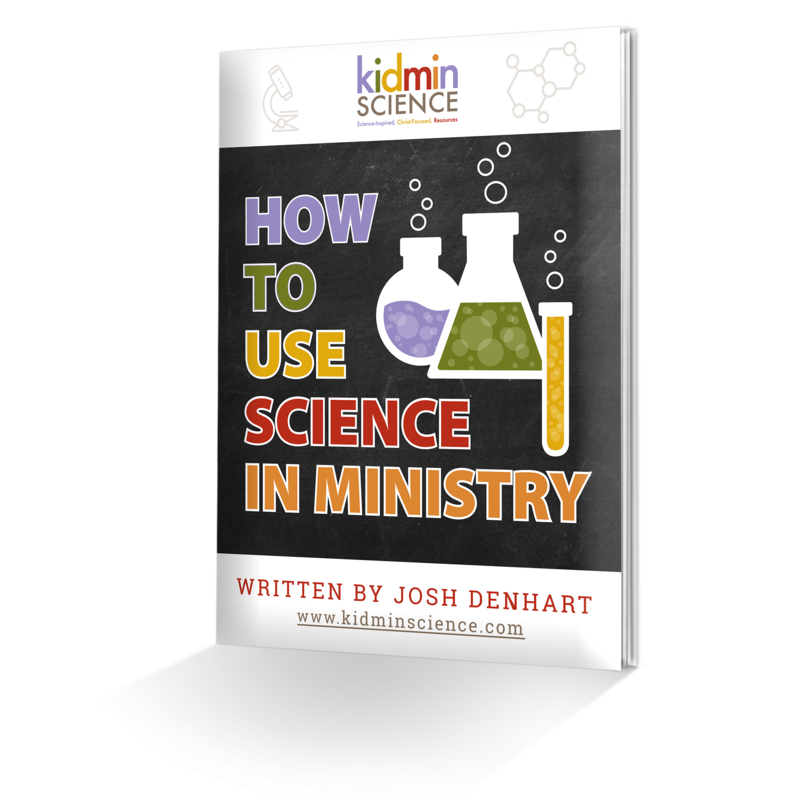 This Science Devotion is simple to perform but is high on impact...literally! “Taking Flight”Learn a brief history of flight and then kids build their very own airplane! Kids choose from three different airplane styles with seven different graphically rich designs. Simple to follow directions and a straightforward tutorial video allows for easy construction. Each airplane will then be put to the test with two different challenges! This Science Project will not only wow the kids, it will wow their parents! “Secret Crystal Symbols” - Learn about the secret symbols used by early believers in the first century. Learn how early believers sought to support one another in a time of ever increasing persecution. This simple but profound lesson will allow kids a special item to take home and keep forever! Learn the power of being an influence and the blessing of being influenced by fellow believers! “Tower Power” Learn a brief history of tower building and feats of engineering wonders through the ages. People have always wanted to build toward the clouds. Students work as teams and build a remarkably unforgettable tower...! Learn about complex 3D geometric shapes and how they are simple to build! This science project is ultra fun and amazingly memorable. "No temptation has overtaken you except what is common to mankind. And God is faithful; he will not let you be tempted beyond what you can bear. But when you are tempted, he will also provide a way out so that you can endure it. “Bendable Bones” - Learn some deep spiritual truths from the life of David and how our confessed sin as believers affects not only our hearts but our bodies as well. This unconventional science illustration will leave a deep impression on all learners! “Chemical Counterfeits” - Do not be tempted! Not all friendships in the Christian life will produce a fruitful walk with Jesus! Learn the valuable lesson that while all relationships may look alike, they may not produce the type of relational reaction we want for our lives as believers! “The Classic Egg Drop Challenge” Ready...Set...Drop it! Learn the brief history of Crash Test Dummies and apply the valuable lessons Crash Test Dummies taught engineers and scientists about making cars safer. With common household items, students will build their own safety structure and protect their own precious cargo! “The Water Bottle Surprise” - A hilarious little science gimmick that reminds us of the truths found in 2nd Corinthians 2:9. God has big surprises in store for all who believe. This little surprise is not only fun and spiritually educational it is sure to bring a soaking surprise! “The Blind Spot” - Our eyes inform our brains. Our brains influence our hearts. What our eyes focus upon makes all the difference! This astounding science activity will stop learners of all ages right in their tracks. Learn some interesting science facts about the human body and learn an invaluable spiritual truth. “Float Your Boat” Learn the science behind buoyancy and water displacement in this classic engineering exploration. Put your learning to the test and explore the basic principles behind boat building. This activity is a hit with learners of all ages! Bring your best game and learn to Float Your Boat! Kids do real science as real scientists. Two age appropriate versions of every project make science fun for preschool and elementary students. Video tutorials make projects engaging for kids and a breeze for volunteers! You get it all! VBS Director manual + ten specialized leader guides for every area of your program! Free access to over 70 exclusive “Training Without the Meeting” YouTube videos to send to your busy leaders! Free access to over 70 exclusive “Training Without the Meeting” YouTube videos to send to your busy leaders! We provide you with four different T-shirt designs and provide you the native files of those t-shirt designs. No, you did not read that wrong! We literally provide you with the native files of all four T-shirt designs. I'm a full-time children's pastor, I have no interest in buying hundreds and hundreds of shirts, storing them in my basement, raising the price and shipping them to you. Instead, I provide you with the file type that your professional T-shirt printer needs. You can order fantastic T-shirts for a fraction of the cost that other VBS publishers charge. This is a big deal! First, I have been a Children’s Pastor in the local church for over a decade. I had to find, recruit, train and educate a small army of volunteers. I get it. I am not an employee of a huge publishing house, sitting in a cubicle, wondering what it would be like to be a real children’s pastor in a local church. I know what it is like to be on staff at a church.